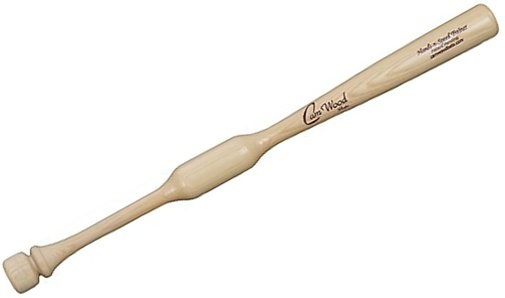 The Camwood Hands-n-Speed Training Bat is a weighted ash wood bat designed to develop bat speed and ensure sound fundamentals. Many training bats (as well as tradtional bat donuts) do not fully develop the necessary mechanics to create true power. They are often overloaded in the barrel, thus causing the casting effect and other mechanical breakdowns. The Camwood Bat is perfectly balanced to strengthen the forearms and create a better hand path to the ball, thus improving bat speed and power. By swinging it 125 times per day in all baseball or softball workouts and drills – tee work, soft toss, machine and live pitching, it is proven that a hitter can increase his or her bat speed by more than 10% in as little as 6 weeks. Watch the instructional video to the right to learn more! Youth Sizes: 28"/34oz., 29"/35oz., 30"/36oz., 31"/37oz. Adult Sizes: 31"/43oz., 32"/44oz., 33"/45oz., 34"/46oz.